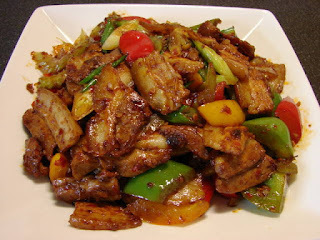 fried pork is probably one of the many well known Sichuan dishes. 1 pound of c, with skin and fat attached. simmer very gently for about 25 - 30 minutes. Remove any scum during boiling/poaching. Take the meat out, rinse and plunge in cold water to cool. Remove pork pat dry and cut into very thin slices. Prepare and set aside the vegetables and other ingredients. Heat the wok with a little oil till hot and fry the pork slices till the meat is lightly browned. Take the meat out of wok, set aside. stir fry them till fragrant. Add chili bean sauce or sweet bean sauce, stir-fry again for one minute. Add celery and peppers. Stir-fry till all vegetables are slightly softened. Add the meat back in and stir-fry till meat is well coated with the sauce. Add spring onion and stir-fry again, for two minutes. Serve hot over white rice or noodles. taste if you need more chili bean and/or sweet bean sauce. Great post!. I'm looking for a stir fry sauce recipe that I can cook for our dinner tonight. Indeed, I really love discovering different recipes. I think the ingredients of this recipe are in my kitchen. Thank you for posting this recipe!